For over eighty years, which is located in Ubud Gianyar, Bali, has been hit by foreign travelers. Ubud is able to provide a lasting memory of time for everyone who came to visit. In fact, Ubud become a quest of love Elizabeth Gilbert, author of Eat, Pray, Love is then raised to the film with the same title and starring Hollywood actress Julia Roberts. There are a variety of experiences that can be picked up by tourists. Ubud itself is seen as a center for arts and culture. Not surprisingly, each activity was associated with cultural attractions, proximity to nature, spiritual, and the relationship between human beings. 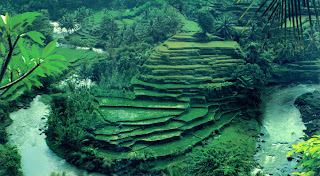 Each activity in Ubud was finally able to give the impression of depth to them. You are interested in spending time in Ubud? Be prepared to fall in love with the magical aura of Ubud. Aura that makes you calm and always makes you yearn to go back to Ubud. Balinese people call this aura as a "taksu". Ubud is identical with yoga. People come from all over the world to study yoga in Ubud. Not only for beginners, professionals also enjoy a yoga session in Ubud. Hotels in Ubud also polish up with yoga. Ranging from providing free yoga classes for guests to provide a special place for yoa. Most of the places where yoga has a panorama of nature such as parks or views over the fields. Remember the scene Julia Roberts in "Eat, Pray, Love" on a bicycle with a background field? Yes, cycling in the rice field is the most popular tourist activities as pleasure in Ubud. Rent a bike is actually easy to find in Ubud. Starting from just around the city center to rent a mountain bike to ride as far to Kintamani. There is a good idea to take a package tour with the bike. With the package of this bike, you will be invited to tour around the fields and into the township residents. You are free to interact and feel the hospitality the people of Ubud. If you do not like biking, trekking tours go just by walking across the fields and into the township. This is the experience of interacting directly with the people of Bali and know the life and culture in which they live. Cooking class in Ubud was rising. Restaurants and hotels provide a cooking class or cooking class for tourists. The material is taught Balinese menus such as convolution and lawar satay, as well as culinary Indonesia such as nasi goreng, gado-gado, or yellow rice. Spa and wellness in Ubud fast growing pamper tourists who come. But local people are familiar with traditional treatments using natural materials as medicine since ancient. Traditional treatments such as spa, massage therapy and spiritual aspects with emphasis on meditation. Balinese society called the "doctor" is traditionally known as "Balian". One of the "Balian" in the famous Ubud is Ketut Arsana. For over 25 years, he provided treatment with massage therapy and herbal medicines. While Ketut Liyer, "healers" who became famous through its appearance in the novel and film "Eat, Pray, Love" approach to therapy with meditation. Because Ubud tourism has developed since before the era of Indonesia's independence, which appeared in the culinary Ubud is also very diverse. You can find culinary Europe to America. Call it a typical gelato Italian, Japanese, Mexican tacos and burritos typical, to French cuisine. Typical cuisine of Indonesia, especially Bali was so popular in Ubud. Try the Balinese fried duck call, certainly the first one is called the eateries in Ubud that sells fried duck. Or, rice epileptic Bu Mangku Kedewatan until chicken betutu in the Public Arts. Ubud is the district with the largest museum in Gianyar. There are six museums can be visited. Almost everything related to art and painting. Eg Castle Museum is the museum's first painting in Bali. Present museum collections in the course of three Balinese paintings of the era, ranging from the kingdom of Bali to the independence of Indonesia. There are other art museums such as the Neka Art Museum, Don Antonio Blanco Museum, Museum Rudana, and Agung Rai Museum of Art. While the new museum is owned by Ubud Museum unveiled a new Marketing 3.0 in 2011. Feels incomplete without the possible intervention of traditional Balinese dance performances for the trip to Ubud. Moreover, considered as an arts center Ubud Bali. Very easy to find places that serve a dance performance in Ubud. However, regular dance performances staged in the evening. Usually on the hour seven nights. You can watch the Legong dance or Kecak fire dance. 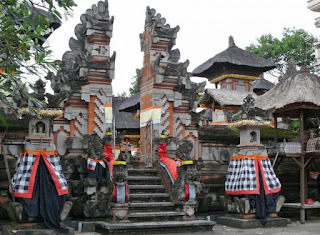 There are two famous places to watch the dance of Bali and the Pura Dalem Puri Saren Agung. Kecak Fire can be seen in the Pura Dalem located in Jalan Raya Ubud. You will be amazed by kemagisan dance. Puri Saren Agung While in, you can see the Legong dance. Besides these places, there are many other places that provide a traditional dance performance and shadow puppets. Admission to the Ubud market, you're greeted with bright colors. Traditional markets are located in the city center offers a range of Balinese handicrafts. Starting from woven bags, clothes bearing the Bali, traditional Balinese clothes, to sculpture and painting. Also try a variety of snacks sold in this market. Should come in the morning. Because, during the day is usually filled by a group of tourists. You can also shop at the market located in Tegallalang. Remember to bargain the price before you buy. The place is famous for rafting in Bali is white water rafting on the Ayung River. There are several operators rafting in the Ayung River. Rafting on the Ayung River in the category of class II and III. Thus, river rafting is suitable for beginners. The uniqueness of rafting on the Ayung River is a panorama on either side of the river. Towering palm trees, the trees on the hill, until the rice terraces. Not only that, in the middle of the river rafting, you'll be taken to see relief carvings of Ramayana Bali artists in rock cliffs. Rafting packages usually include lunch and shuttle. Ubud is home of the monkey. You should stop by and take a walk in the Forest Monkey. Here, the monkeys roam freely. Many tourists are fun pictures with the monkeys. But be careful sometimes mischievous monkeys are taking things the tourists. Monkey Forest at the entrance, visitors are greeted a large monkey statue. Well, when entering the forest area of ​​about 27 hectares, the atmosphere is cool and beautiful welcome. Inside the temple there Mongkey Forest which is also frequented by tourists.